The Weekly Youth and Young Adult program offers the opportunity for youth and young adults with autism to get together and have a good time in a safe and supportive environment. This program is intended to provide fun activities where participants are encouraged to get to know each other and build peer relationships. Thanks to generous funding support from Mountain Equipment Co-op (MEC), CAN will be introducing a weekly rock climbing program in January 2019 for youth and young adult members in North Vancouver. 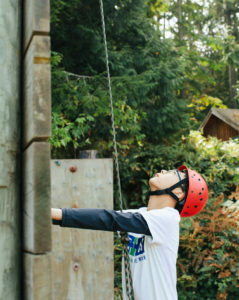 In partnership with Power To Be and Climb Base5 North Vancouver, participants will have the opportunity to learn to climb in a safe and supportive environment, meet new people and build their fitness. This program is intended for youth and young adults with an interest in climbing who would like to continue the activity on their own or with friends and family after participating in the CAN program. Each session of the program consists of 1.5 hours, once per week, for multiple weeks. Sessions for this program takes place three times during the year; Fall (mid-October to late November), Winter (late January to early March), and Spring (mid-April to late May). The activities will vary each week. Indoor activities may include board games, snack preparation, video games, and dance parties. Up to 10 participants will be enrolled in each session, and supported by a program leader, support workers, and volunteers.